Serial killer Charles Manson may be dead, but the infatuation society has with him seems like it will never die. Christopher Bryant's Sneakyville is a darkly comedic look at this obsession through events that took place during that time, events that could have happened and events that could happen when the darker side of our nature is explored. In the first act, Bryant gives the audience a crash course on who the Manson Family were leading up to the evening of August 9, 1969 when actor and model Sharon Tate - along with five others (including her unborn child who she was 8.5 months pregnant with) - was brutally murdered. Bryant's script and Daniel Lammin's direction ensure that the tension is dialled up without the need to depict any violent or gruesome scenes. Bryant cleverly speeds through the next 50 year period informing us on the aftermath of the murders, including the Family's eventual arrests, sentencing and parole appeals, and how Manson influenced (and continues to influence) popular culture. The second act begins to delve into the psyche of what an “evil” person is and just how easy it is to "switch sides". It is here we are introduced to an imagined reality where Manson is still alive and still imprisoned. It's 2018 and he is being interviewed by a journalist, who just happens to be eight months pregnant. Wil King as Manson finds the perfect blend of charm and menace in this role and he gives a highly expressive performance, with his eyes radiating equal warmth and coldness and a smile as sinister as it is welcoming. It’s a little unsettling how natural he appears playing a person like this. Kristina Benton as former cult member Sandra Good is an example of how easily someone could be swept up into the Family. While not present during the Tate murders, her involvement with the cult has haunted her ever since. It’s left up to the audience to determine whether she should be forgiven for the role she played and if her continued treatment is justified. Her scenes with Patrick Durnan Silva provide a sympathetic perspective to the events and serve as a reminder of how easily manipulated people can be. Audience members sit on either side of the long, narrow performance space, with the cast entering and exiting the stage like models on a runway, forcing us to consider and who is performing (within the play) and for whom? As Sneakyville continues, we wonder if what we are seeing on stage are sincere moments or if we are in fact being deceived. 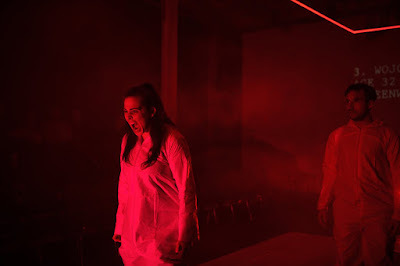 While the space provides a claustrophobic intimacy to the production, the scenes when clear plastic curtains are drawn across both sides of the stage only succeed in drawing us out of the performances and preventing the audience from feeling the tension that has worked so well throughout Sneakyville. Lammin ensures the audience never gets lost in the fantasy of the show and keeps it grounded enough to ensure that there are still plenty of surprises to be uncovered. Even those familiar with this particular moment of history will find enough in Bryant's script to satisfy their dark urges, and leave you questioning if Charles Manson really is "only what lives inside each and every one of you".